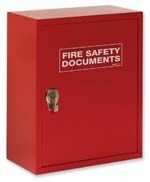 The Safety Centre has a range of fire alarm log book cabinets available to buy. These cabinets are designed to be positioned near to a fire alarm system control panel and gives the user a safe place to store important documents about the fire alarm system. The Fire Alarm Log Book Cabinet range features a lockable front door which means that documents within can be accessed by only authorised people with the key for the cabinet. Our range features white, red and grey cabinets to suit the styling of the building in which they are to be used. If you’re interested in our Fire Alarm Log Book Cabinet range you may also be interested in our Fire Alarm Log Book and Emergency Lighting Log Book selections.